Datacide Fourteen is officially released on October 18 and 19, 2014 in London. Datacide will be tabling at the London Anarchist Bookfair on Saturday, October 18 from 10am – 7pm. We will be selling the new issue, back issues 9-13, as well as new Praxis records. The venue is Queen Mary, University of London, Mile End Road, London, E1 4NS. On Sunday, October 19, 2pm-11pm, MayDay Rooms, Datacide, Cesura//Acceso Journal, and the History is Made at Night blog are hosting the event “Revolt of the Ravers: The Movement Against the Criminal Justice Act, 1994”. 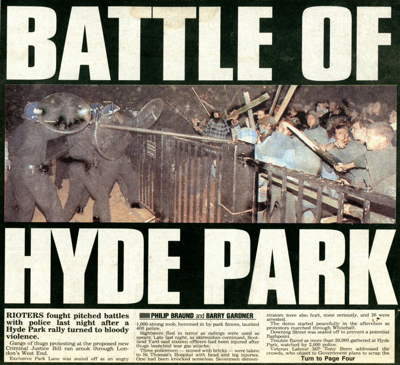 Twenty years ago, on 9 October 1994, a huge demonstration against the Government’s Criminal Justice Act ended in London’s Hyde Park with riotous clashes, police horses charging, and people dancing to sound systems. The Act brought in new police powers against raves, squatters, protestors, travellers and others, and was passed amidst widespread opposition. This event will include memories of this movement, its ways of organising and representing itself and will feature displays of its ‘material culture’ such as zines, flyers, cassettes and letters. There will also be an exchange-situation looking at the related radical/techno zines of the 1990s, in what was one of the last musical and social movements mediated primarily through print rather than digitally. It is hoped that the day will be a catalyst for a process of gathering, archiving, circulating and activating materials from the radical social/musical movements of the 1990s. The talks and discussion will be followed by an evening of films, music and refreshments.